When riding the dusty trail of the internet, it's not uncommon to encounter several illegitimate beliefs and manipulations from intolerant atheists and evolutionists. Evolution is a cornerstone of the atheist religion, and not only have attacks on contrary views intensified, evolutionary indoctrination in schools is also increasing. Ironically, proselytizers of evolutionism do not understand it themselves, but they're "certain" that biblical creationists are wrong, and want us silenced. Aside from opposition to the truth, these folks are opposed to critical (logical) thinking, which would put atheism and evolutionism under anatomization and possible rejection. Christians and creationists need to stand firm, become more educated in both Scripture and science, and continue to put burrs of truth under their collective saddle. Atheists are the smart ones? Atheists claim to be more intelligent than Christians, and especially those of us who reject fish-to-fool evolutionism. A common mantra of the atheist religion is, essentially, "We are smarter than theists". So, does joining the club instantly make someone intelligent? Not hardly! I've encountered many atheists on the web that are excerebrose, and try to prove that they're smarter than us st00pid dumb Xtians, but usually fail to demonstrate the ability to reason. A large number of the greatest minds in history have been theists, and many founders of modern science have been biblical creationists. Big deal. There are studies for many things, and quite a few of them are fundamentally flawed. What questions were asked? Of whom? When? Where? Under what conditions? Do they mention the study that shows how atheism uses less brain function? I reckon not. There are several points about studies that need to be considered. A recent article in a science publication entitled, “Why Are Atheists Generally Smarter Than Religious People?” author Laura Geggel starts out with the complex question fallacy. That is, it should be two questions: "Are atheists generally smarter than religious people? If so, why?" Laura also makes a false, impossible assertion that scholars have wondered about this alleged greater intelligence (as if it were a fact) for "more than a millennium". Retract your claws, kitten, intelligence tests aren't that old. Also, tests only measure certain things — especially the ability to score well on a test. Even if the claim was correct, it would not mean that atheism is true! A big part of this educational indoctrination is the belief in atoms-to-atheopath evolution. As other creationists and I have pointed out for a mighty long time, evolution is presented at every turn, including music, advertising, movies, works of fiction, legitimate science research corrupted into the obligatory homage to Darwin, and much more. It was determined that children are born theist (despite the false assertions of atheists), so evolutionary indoctrination is ramped up. See "Accelerated Evolutionary Indoctrination of Children" for more. Evolution is the atheist's creation myth. With it, they try to justify their rebellion against God and suppression of the truth (Rom. 1:18-23) so they can appear "intellectual" and "scientific". As we have frequently seen here and in sites that are linked, there is a paucity of actual science as well as logic in evolutionary dogmas. Hysterical assertions and omissions of pertinent contrary evidence, those are certainly presented. Whatever it takes to get someone to believe in evolution, right, pilgrim? I've had people criticize things I've posted at The Question Evolution Project as well as on this site, and demand explanations from me regarding the work of others. This happens to other creationists as well. Somehow, we're each expected to have all knowledge of everything we share, and must be a physicist, astronomer, geologist, biologist, microbiologist, psychologist, geneticist, whateverologist on demand. If I refuse to speculate on matters in an article, the frequent conclusion is that since I can not or will not answer, it's "proof" that creation science is false and there is no God. No, scoffers cannot be bothered to contact the author or organization the gave us the article or video in question. Yes, that's how logic works for many anti-creationists and atheists. Another disingenuous tactic is to complain about what is not in a post, article or video, while at the same time ignoring material that is provided. I've posted short videos that contain interesting information, and atheopaths call creationists "liars" because a certain topic was not addressed in a video or article. Just how long do these tinhorns want an article or video to be, anyway? Much of what I share is made or written for us reg'lar folk, and the scientific discourses are linked elsewhere. Mockers conveniently ignore the part about, "To find out more, go to our site", and even the additional resources that many provide — including scientific material. It's not difficult: watch the video, go to the site, do further reading. That is too much like thinking for many opponents of God and creation, rquiring intellectual honesty from a serious inquirer. Besides, their goal in such cases is to silence creationists through ridicule and misrepresentation, attempting to negate what we have to say without actually dealing with the content. A further manipulative tactic is to smugly assert the definition of evolution, and give a simplistic, malleable definition that can "prove" almost anything. (This is similar to the bullying approach of saying that if you deny evolution, you must not understand it. Such a lie has been dealt with many times elsewhere, including here to some extent.) But many evolutionists do not really understand evolution themselves! Even so, I'll take the word of creationary scientists over that of some internet saddle tramp with a bad attitude. Unfortunately, Darwinoids evangelize people into their worldview. They think they're doing good things (Jeremiah 17:9, Matt. 15:9, 1 Tim. 1:13-15, Psalm 14:1, Rom. 6:23), by attacking God, his people, the Bible, and creation science. But atheists do not have a consistent moral standard, and are unable to account for morality itself. In addition, they show that they are standing on the biblical creationist worldview when they say something is right or wrong. Some accuse us of being "liars" when we say something they dislike. Even if we did lie, they cannot say why it would be wrong. In their materialistic paradigm, there is no free will, and we're all just dancing to our electrochemical impulses. It is hypocritical of the atheist evangelist to condemn Christians, since we are "born that way" and have no choice, according to their paradigm. By the way, this is one reason that professing atheists have antipathy toward presuppositional apologetics: we show the internal consistencies of an atheistic worldview. Further, we are unwilling to to elevate man-made philosophies (science or otherwise) above the Word of God; they have their presupposed starting point of naturalism, ours is the Bible. Atheism is irrational and incoherent, and only the biblical worldview contains the necessary preconditions of human experience. I took a side trail there, now back to the main one. Atheists push evolution, because evolution is a gateway to their belief system, and evolution is a pseudo-intellectual appeal to pride to justify rebellion against our Creator. See "Evolution Is the Doorway to Atheism" and "Evolution makes atheists out of people!" for further information. Secularists and other evolutionists are opposed to critical thinking, especially in education. 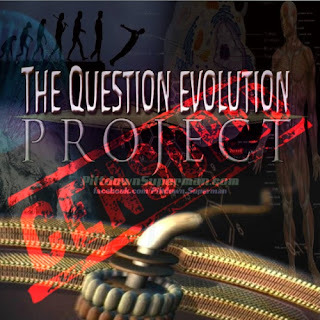 Biblical creationists strive to teach people how to think, to perceive errors in reasoning, to notice how evolutionary owlhoots put forth speculations and bad science as if they were established facts, and so on. Darwinists and atheists are more interested in telling you what to think. I suspicion they use Brave New World by Aldous Huxley and Nineteen Eighty-Four by Blair's pupil at Eton, Eric Arthur Blair, as an interfused instruction manual for life, education, and morality. For example, this animation of whale evolution is cute, and people will think that evolutionists are such brilliant people. Except that the video is misleading, since there is no justification for the purported changes — especially zillions of missing transitional forms. The animator admits that "we don't know exactly what those ancestors looked like". But it is presented as "science", and Darwinoids are willingly deceived, then the commence to spreading further disinformation. Did you notice that people who complain about "intolerance" are often the most intolerant? This is actually fitting with evolutionary thinking! If you study on it a spell, you'll see that demonizing people so they are unwilling to allow other people to present their views helps atheistic and evolutionary views. That worldview continues its dominance — especially in academia, nay-sayers are streng verboten. Also, consider that (generally speaking), materialists espouse leftist elitism, and Bible-believing Christians tend to be more on the right politically. Albert Mohler has an interesting podcast/transcript on The Briefing in "Is your pastor a Democrat or Republican? The fascinating link between denomination & party affiliation". Atheists and leftists think they're taking the morally and intellectually honorable high road by attacking Christians, God, the Bible, and creationists. They suppress what we have to say, and they demand "equal time" with against, even on our own sites, forums, social media, and so on. The end justifies the means, mein Herr?) I believe this is out of fear of the truth, and because they are controlled by their father down below (John 8:44, 1 Cor. 2:14, Psalm 14:1, Rom. 1:18-23). 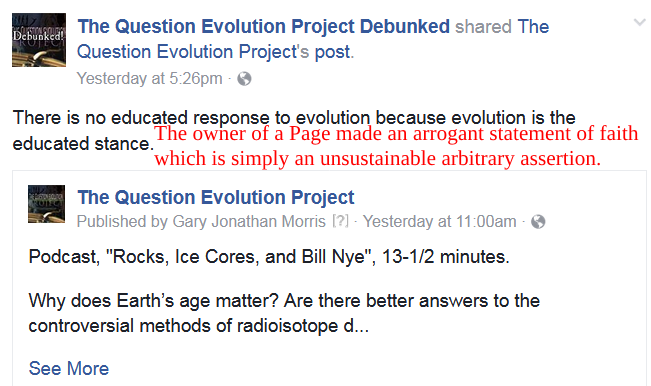 Ironically, evolutionists and atheists are the ones guilty of the censorship that they decry (here is just one of many examples), and they complain about not being given a platform on creationary sites and Pages as well; they want theirs and they want ours, but a biblical creationists is hard pressed to get a fair hearing from atheists and evolutionists. This atheopath even brags while playing the victim card because his bigoted diatribe was deleted — by Facebook, of all things! If these atheists didn't have double standards, they'd have no standards at all. I'll allow that not all atheists are sidewinders like those discussed here (generally considered "New Atheists"; the only thing "new" about them is the intensity of their hatred and vituperation.) Not all atheists are bigots, but they don't seem to care about the vile behavior of their fellow travelers. For example, this anti-creationist forum apparently approves of atheistic bigotry and libel. Other professing atheists don't seem to make their presence known on the web nearly as much, nor do they police their own and say, "Hey, that's not cool! Our reputation is bad enough without your bad behavior!" The foundations of creation in Scripture are vitally important, and the opposition is intensifying. Christians need to know what and why they believe. This ministry, and many of those where I direct readers, seek to equip Christians to stand for their faith, learn that both science and Scripture support biblical creation, and we hope that intellectually honest skeptics will question evolution and learn about the truth of creation. Nobody is saying that it's easy, but in the end, it's worth it.